Alice Hill, 85, of Santa Marta in Olathe, KS, died on Saturday, Feb. 2, after a day surrounded with love by family. Alice was born in Fort Scott, KS and spent most of her life in the Kansas City area. The oldest of three children, Alice graduated from Fulton High School. She married her husband Jack in 1954, and went on to have four children together. Alice was dedicated to her faith, and she and Jack were founding members of Good Shepherd Catholic Church in 1973. Alice also enjoyed being part of the church choir for many years. A talented seamstress and baker, Alice was profiled in the “Come Into My Kitchen” section of the newspaper and known for her incredible garlic bread, sandies cookies and cinnamon rolls. 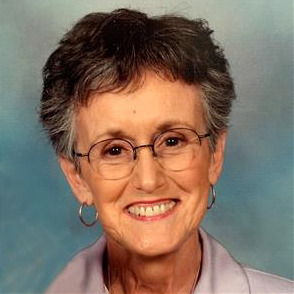 After a busy career as a housewife who served as a room mother and hosted book clubs, Alice worked in Support Staff at Southwestern Bell for over 25 years. Alice found joy in taking care of herself - learning to swim during retirement, doing water aerobics, yoga and tai chi, and believing sunscreen and vinegar were your best friend. A pioneer in her day, she attended the first aerobics classes at the Life Dynamics Center at Shawnee Mission Hospital. She enjoyed listening to jazz music and watching sports - from KU basketball to golf. Alice was an avid reader and still used her original Johnson County Library card. She never tired of rereading her favorite books, and if one started off too suspenseful, she had to read the ending before continuing. Alice scheduled her days around Mass, Friday Happy Hour with her friends, and seeing family. Alice found great pleasure in following the weather, drinking her favorite green tea and attending family gatherings (which she enjoyed even more once she wasn’t in charge of cooking for them!). She was preceded in death by a son, Greg; granddaughter, Jessica; son-in-law, Kent Carter; brother, Steve; and both parents. Alice is survived by her husband of 65 years, Jack; 3 children and their spouses: Kathy and Tom Tarbutton, Suzy Carter, Kevin and Carla Hill, daughter-in-law, Kathy Hill; her sister, Sherry White; grandchildren Valerie, Natalie, Jacky, Abby, Kaitlyn, Shawn, Maggie, Jack, Christopher, Sarah; great grandson Harlan; honorary grandchildren Michael, Peter and Andy; along with extended family, friends and neighbors. The visitation will be from 9:30-10:30 a.m. Saturday, February 16 at Good Shepherd Catholic Church, 12800 W. 75th St., Shawnee, KS with the Funeral Mass to follow at 10:30 a.m. Burial will be in Resurrection Cemetery in Lenexa. In lieu of flowers, the family suggests memorial contributions to Catholic Charities of Northeast Kansas.